Every Time It Rains by Nikita Singh is her latest novel which is another warming love story of a heartbroken girl Laila. 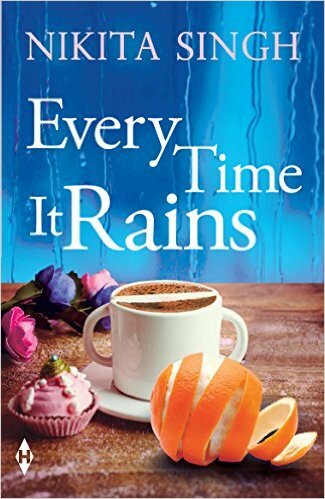 The book, Every Time It Rains, was released on 12 Feb 2017; just before valentine’s day. The story of Every Time It Rains by Nikita Singh is about Laila who is hurt and still recovering from a bad relationship. And to divert herself, Laila has dedicated herself to her bakery that she runs. Her dedication pays and she gets an opportunity to go nationwide if she cracks a really important deal. When everything was going fine, the plot of Every Time It Rains gets a twist and the past of Laila strikes back but in a new face. The second main character of the novel, Every Time It Rains by Nikita Singh, comes into the life of Laila. His name is JD, a careless, free-spirited guy who can’t just keep calm. Towards the climax, Laila and JD are drawn to each other despite being exactly opposite of each other. Laila has gone through the pain of love and might not trust anyone further but the presence of JD makes her feel the way she wanted to forget. The novel, Every Time It Rains by Nikita Singh, is all about learning to love again with a broken heart and how love has all the power to mend the shattered pieces of heart back together. Touching story that will restore your faith in Love! Nikita Singh is a bestselling Indian author born in 1991 in Bihar. She spent a part of her life and studied Pharmacy. While her day in college, she wrote her first novel, Love @ Facebook, in 2011. The book became popular and she wrote its sequel in the same year. Nikita has published two more books with the author Durjoy Datta. Nikita has written nine novels. Her last novel, Like a Love Song, was published in 2016. Nikita is currently pursuing MFA in Creative Writing from New York. She has also received the Young Achievers Award in 2013. Nikita also speaks at various TEDx talks across India.